Flexible magnets in forms of strip and sheet are magnetized in multiple poles concentrating magnetic power on one face to provide maximum magnetic pull. The back could be in three ways: Plain Back, Pressure-Sensitive Adhesive Backing and White PVC Film coated. Strips and sheets of flexible magnets are easy to cut with household scissors or a utility knife into any shape without losing almost any magnetic power. Furthermore, they are better to hold to uneven metal surface than any other kind of magnets due to their flexibility. Flexible magnets have a low magnetic power and low magnetic strength compared to other types of permanent magnets. 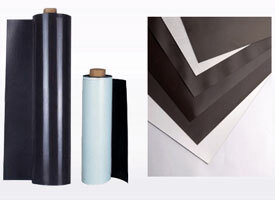 But with flexibility, flexible magnets are easy to be bend, cut, punch and machine. 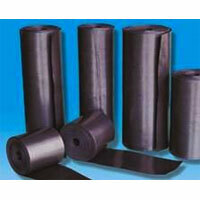 Therefore, flexible magnets are widely used in home, commercial and industrial applications. Fridge Magnets are always used as ornaments, sometimes as memorandum which is like notes. The contents on it is for reminding family members doing something or not doing something, such as “Broccoli in it. Buy eggs and potatoes. ” Fridge magnets can also be used to teach young children the alphabet and spelling. They are attractive for children and would be a useful and fun teaching tool. 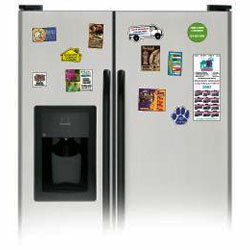 Fridge Magnets are made from magnetic powder and plastic binder, which are mixed and then extruded into a sheet. There are two kinds of fridge magnets: magnetic fridge magnet and adhesive magnet. 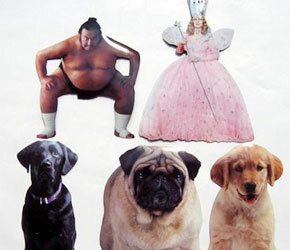 In most circumtances, fridge magnet usually refers to magnetic fridge magnet that can be recycled. 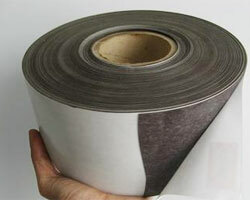 The plastic cover or paper cover can be changed , while the flexible magnet can be used for more than 40 times. Since the first fridge magnets were produced in the 1970s, more and more people fell in love with them and started collections. It is very easy and convenient to change the content on the magnet because they are printed on magnetic paper which is easy to operate and is also very easy to die-cut into any shape you can image. China High itech Magnet can realize firdge magnets in accord with your various requirements with high-quality and cheaper price. If you haven’t found what you need, please clink www.chinahighitech.com and we will respond your inquiry as soon as possible. 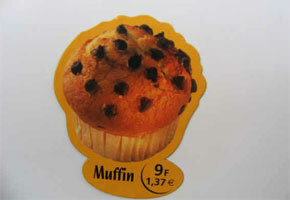 Car magnets are almost the same as fridge magnets materially but with different usages. Comparing with fridge magnets used mostly for daily-life, car magnets are widely used for business promotion as they are put on any vehicle. Nowadays many people choose TV, magzines, and newpapers to promote their services or products at the cost of large money. 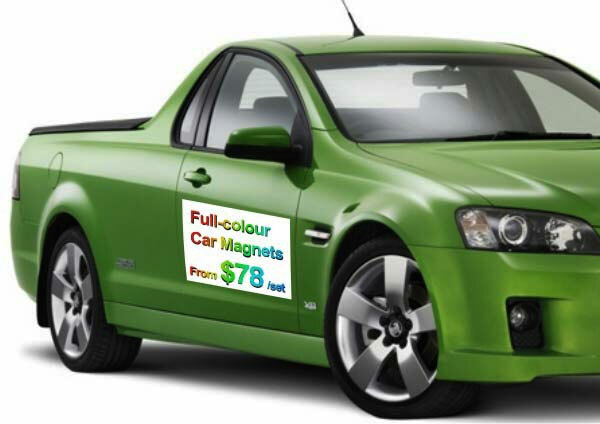 However, the purpose of promotion by car magnets is very optimistic because the targeted audience will see your advertisement and read your message whenever the vehicle goes. The impact of such promotion is larger than that of static advertisement. Small or large car magnets can be easily put on cars especially on car doors. So they are often called car door magnets. 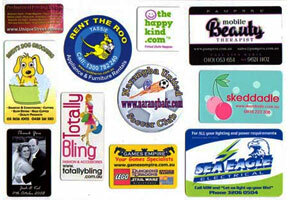 The content on them can be changed for several times and car magnets tend to last a significant period of time. Further, they do not usually come across as an intrusive form of advertising, which may make them more acceptable in the minds of some people. Car magnets are often used to support a favorite sports team. Especially in college towns, they are used to express the pride in the team. 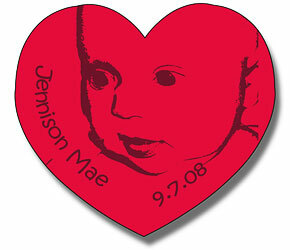 Meanwhile, car magnets are usually much less expensive than customized magnets because they are usually sold in bulk. 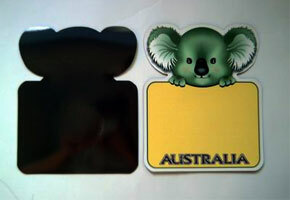 Besides, car magnets can be realized by	www.chinahighitech.com in different sizes and shapes and look very attractive for targeted audience. As you know, the magnet made by China manufactures is high-quality, the second best one in the world except Japan. And China polar magnet Co., Ltd. is one of the largest manufactures in China. Business magnets are very popular in the world. In fact, it is an informal name because there is no specific magnet used as business magnets. They are named in this way because of their usage---business promotion or advertisement. Business magnets include business card magnets, promotional magnets, restaurant magnets, car door magnets and business logo magnets. Imaging when you want to find contacting information of a cleaning service, express courier, computer repair, or any other service, you find none of them at home or office. How awful it will be. If you can find the information after one glance to a business magnet on the wall or fridge, it is much more effective than looking into internet or calling service number. It is hardly to find anything better than business card magnet to keep your company’s contact information handy for your targeted customers. For example, restaurants often use business magnets to promote their take-out or delivery service as well as booking. Auto repair companies, cleaning service, plumbers, electricians and tax-service should always send business magnets with their contact information to targeted customers. For those who can provide other professional services such as printing machine sales, computer fittings and so on, they’d better make a great many of business magnets to get more orders.